No family trip to the Adriatic is complete without a celebratory dinner at some seafood restaurant near the water. There’s usually good bread and oil, a wide selection of local wines and giant scampi to pose for vacation photos with. Awkwardly shaped sunburns from earlier that day fade in gradually, the red glow contrasting noticeably against bright white sundresses. There’s also usually a sunset involved. A trip to Piran is no acception to this rule and Prešernovo nabrežje is the restaurant-lined promenade on which to do the Overpriced Seafood Tourist Shuffle in this town. We chose Pavel 1 (as opposed to Pavel 2 just two streets down) because it looked the most baby-friendly. The menu was pretty much the same as that of any other seafront spot on dock – pastas, fish and seafood platters to share. We ordered a local dry white and a heap of bivalves. Some squid made an appearance too, along with that tricked out mascot of team Overpriced Tourist Food – the scampi with the head still on. We had a platter of mixed shellfish with mussels, razor clams and Venus clams plus another bowl of just Venus clams. 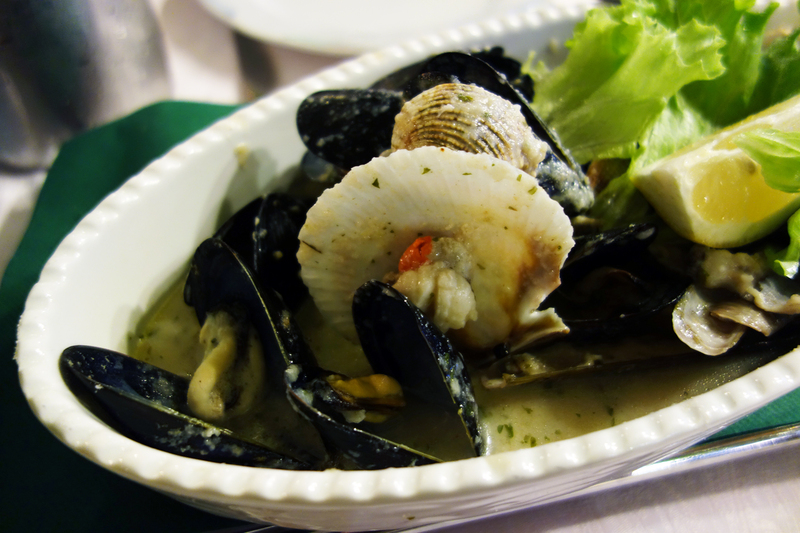 These came in a light white wine broth which that gave the shellfish a good amount of flavor. They were fresh, plump and not too chewy. Bread dipped in the wine sauce added substance to a dish that otherwise would not have done much to appease my hunger. 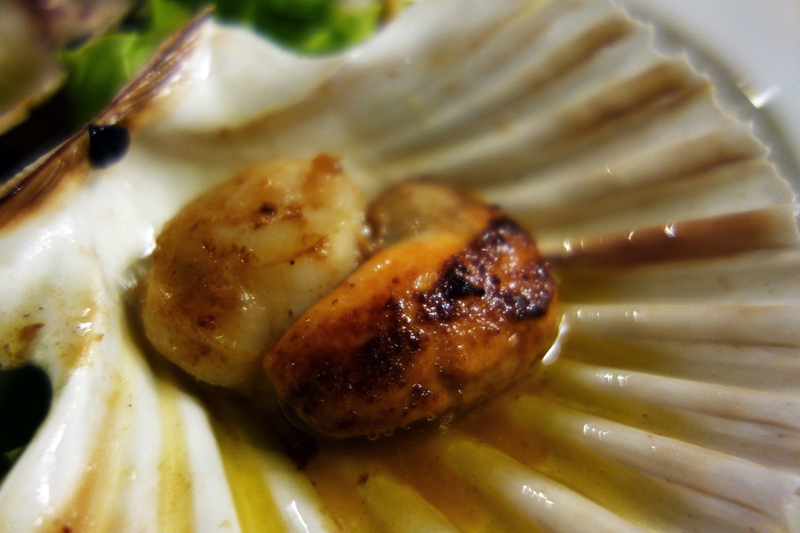 I was in the mood for scallops that night so I ordered some and was very pleasantly surprised when they came with the roe left on. In addition to being delicious, scallop roe serves as a good indication that the stuff is fresh, because while the muscle can be overcooked and over-salted to hide the funk, not-so-fresh roe screams out at ya’ something foul. 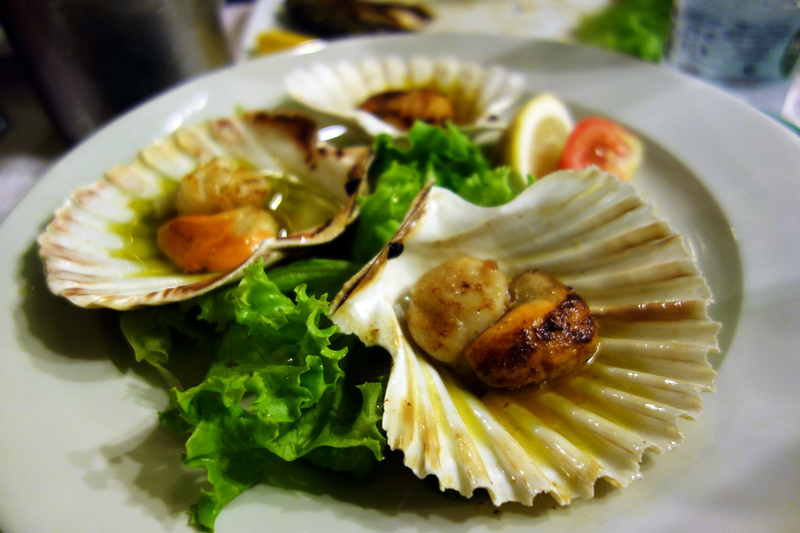 In this case the scallop was wonderfully fresh and grilled to a good texture, the flesh still slightly translucent and very soft. Both muscle and roe had a nice char from the grill and a smokiness to go along with it. The roe had a subtle brine to it, though not overwhelming and that wonderfully mushy, liver-like texture I prize so highly. 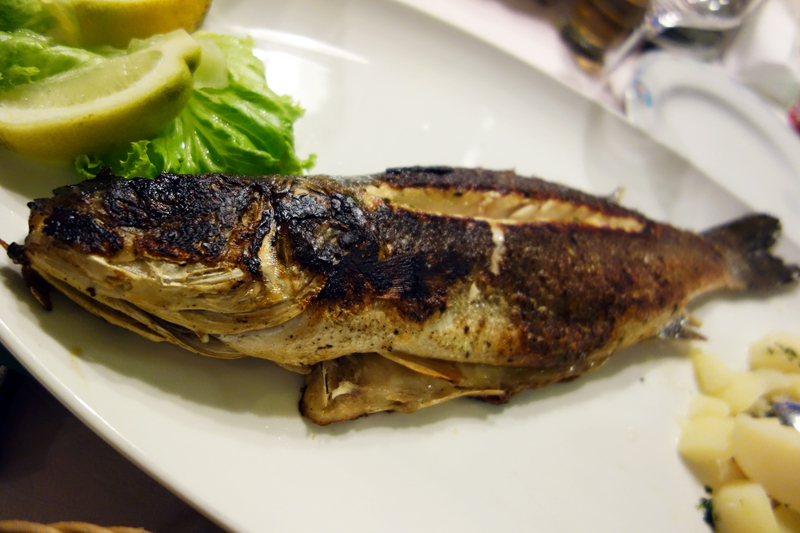 A plump grilled sea bass was deboned table-side for us and served with just some lemon to squeeze over. Beautiful fresh and moist white flesh and some charcoal-licked, near burnt skin to give it some smoke too. A good, fresh, local beast prepared well and seasoned minimally to let the natural flavors dominate. Although all the usual traps were there on the menu of Pavel 1, the shellfish was fresh and the fish not overcooked. Service was friendly too, especially towards the end. When I inquired about the accessibility to a winery I was hoping to visit, our server brought out a topographic map of Slovenia in order to accurately direct me. It’s for tourists – yeah – and prices are high by Slovenian standards but still very low by the standards of most foreigners who eat there. Sometimes the view is worth the splurge, especially when good seafood is involved too. July 18, 2014 in SLOVENIA.